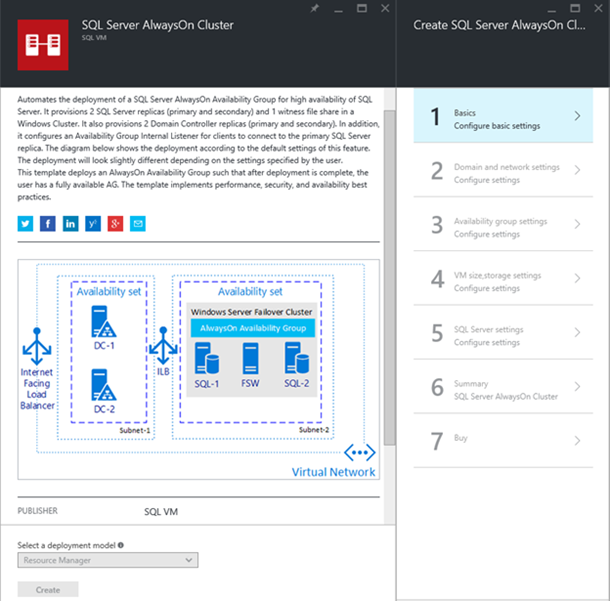 We made some exciting improvements to our SQL Server AlwaysOn Cluster template in the Azure portal to improve security, availability and performance. All of this ensures the template can be used to deploy production-ready clusters that meet your availability, performance, and security requirements. To improve the security of this deployment, the template now takes advantage of an Internal Load Balancer for your Listener endpoint. This means you can only connect to your primary replica from within your Virtual Network. Now, we made this part of the provisioning experience for both single SQL VMs and SQL VMs create by our AlwaysOn Cluster Template. In this template, you can specify how much storage you want, between one and four Terabytes to start (this will of course increase in the future). Based on your input, we attach the required number of data disks and configure them. If more than one data disk is required, we will create one Storage Pool across all disks with our performance best practices according to the workload type you specify (online transactional processing or data warehousing). You can now select which version of SQL Server you wish to use for your SQL Server replica VMs. Whether you wish to use SQL Server 2012 and 2014 (all Enterprise edition), you simply select the version you require. We will soon also have support for SQL Server 2016 CTP3. To improve the availability of your cluster and your domain, this template now takes advantage of the Automated Patching feature. This feature configures a patching window for your VM to ensure any patching and subsequent reboots only take place during the specified time window. When this cluster is deployed, each virtual machine will have a different patching window so no two VMs that are part of your AlwaysOn deployment will go down at the same time due to patch updates. We have updated the AlwaysOn template to support Azure Resource Manager. This means we will soon add ARM templates to GitHub which you can then customize and deploy via PowerShell. Find more details in our documentation. You can give these a try in the Azure portal today. If you do not already have an Azure subscription, try it now for one month, free.